Our web site is new!! Its now easier to access all of our information from your mobile devices. People ask, “Where do you get your ideas?” I really don’t know. They sometimes come to me at 2 or 3 am. That’s when “The Committee” is in session in my head. (I’m sure that many of you can relate!) Sometimes ideas come from others who have seen or worked with my techniques. Sometimes one idea morphs into something completely different! We continue to make videos on our techniques and on specific pattern instructions. Go to the "Tips, Videos & Oops" page. Scroll down to see videos listed by pattern. "The Committee" has also been busy this year. See the "Patterns" page for our new offerings. They are listed first. Also, look for the videos associated with each pattern!! Go to the "Tips, Videos" page on this website; scroll down to the pattern (listed numerically) and click on the video links. If you have a smartphone with a QR code reader app, you can also access videos directly from some patterns. Just focus your phone on the QR code and a video will pop up! AT619 - Brooke's Bag - Great everyday bag with a wide bottom and four inside pockets. AT617 - Poppins Bag and AT627 - Poppins Bag Stays - our most popular pattern for 2017!! Large travel bag with stainless steel structural stays to help keep the top open as you fill it up!!! Pattern comes with one pair of stays. Or buy an extra set of stays for a second bag. AT616 - All Buttoned Up -Fun and different way to make a bag. Buttons are the secret. 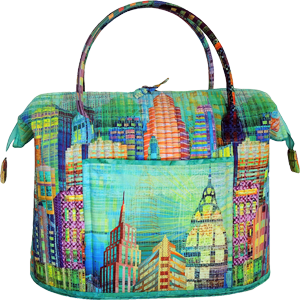 AT615 - Rockport Carryall - Show off your magnificent digital prints! Large and medium sized open top tote. Use Bosal's In-R-Form Plus for structural support. Sides are channel stitched for extra strength. AT614 - Leave the Light On - House can be used as a great night light or decorative holiday container. Use Bosal's pre-cut interfacing to build your house. Woven Spirals - Unique way to create a bowl. Use fabric, cork or designer felt!!! Wine Carrier Kit - includes all the interfacing needed to make a cute wine carrier. Just add two fat quarters, thread and buttons or other embellishments. Holiday Stockings - Festive stockings that light up!!! One for your mantle and one for your tree! Mini Clutter Catchers - Organize the clutter - set of small bowls to help keep everything in place. Sooo many ideas and so little time! !